I had a moment about my bread at the end of last year. I’d finally succeeded in getting the desired crunchy crust associated with good bread and I’d managed to make the bread easily and without any sweat. At the time I didn’t have a scale so I was doing everything by converting the weight measurements into cup measurements. The good news is I finally got organized and bought a scale so now I can tell you all about how I make this bread. This is pretend sourdough because it isn’t made with a sourdough starter. 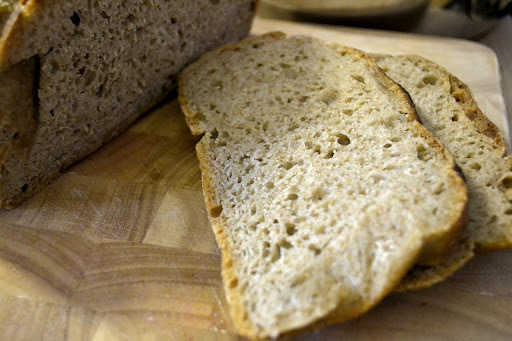 Rather, you leave the bread mixture overnight so that it sours and then you bake it the next morning. It doesn’t have a truly classic sourdough taste but it makes for a refreshing change from regular bread. It requires a little forethought – you need to leave 12-18 hours between making the dough and baking so don’t start at 9 in the morning because you’ll be making bread at midnight. If baking bread at midnight is your thing, obviously go right ahead. Personally I like to make this on Friday or Saturday evenings because then I have fresh bread over the weekend. It only takes about 10 minutes to get it all together and then you leave it to do it’s thing anyway. My bread doesn’t look like something you’d actually pay money for in a shop but it makes the house smell amazing and it tastes great spread with butter and marmalade or underneath boiled eggs or as a sandwich. This has become my go to recipe due to it’s ease and lack of kneading. I’ve adapted it from Vegetarian by Alice Hart. I love love love this book. I eat vegetarian often – mainly because meat is so expensive here – and it’s my go to reference book for dinner. Lots of more-ish recipes that are easily adapted and changeable depending on what you have available in the house. I’ve used both spelt and wholemeal bread flour. I like spelt flour, mainly because of it’s novelty (it wasn’t available in the ZA when I left) but also because it adds an earthiness to the bread. I also use more water and slightly more yeast. 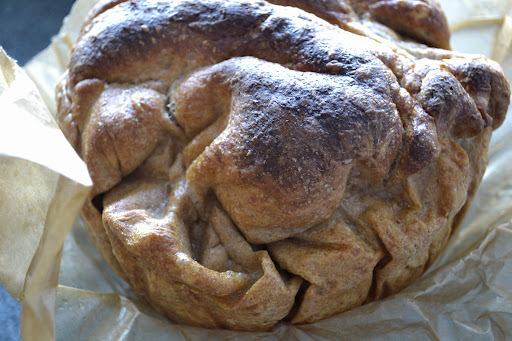 The result is a very shaggy, unmanageable dough that you just ignore until it does magic tricks in the oven, transforming into something slice-able and edible. Dissolve the yeast in 1 cup of warm water (around body temperature – too cold or too hot and you’ll commit yeast murder) and leave it to activate (about 5 minutes). Place the flours and salt in the bowl. Add in the yeast water and stir. Add in more water until you develop a very shaggy dough. You shouldn’t be able to lift this or knead it or anything. Cover and leave in a warm room for 12-18 hours. Preheat the oven to 200C and place a heavy lidded pot inside to heat. (I use my Le Creuset heart-shaped one.) When the oven is at temperature, lift the baking paper and the dough and place inside your pot. Put the lid on and bake for 30 minutes. Then remove the lid and bake for a further 15 minutes until the bread is dark. Tip the bread onto a wire rack and allow to cool completely before eating. 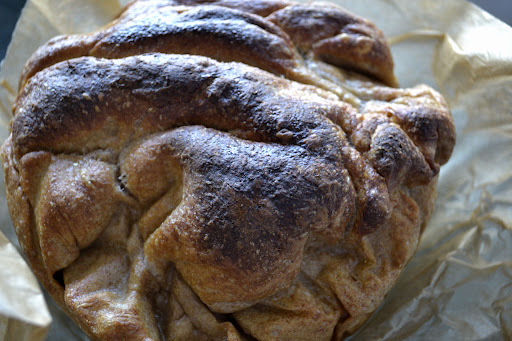 It’s the funny, wrinkled shape because the dough is shaped when you pick it up and place it in the pot. My pot is heart-shaped so it takes on some of that.